Most of the last day of my trip was spent visiting USC and talking science, but at the end of the day there was an informal gathering with some graduate students. Two students, Sean and Matt, knew that I was a beer lover and had arranged for me to try some local beer, the best of which was an IPA from Golden Road Brewing in LA. Very hoppy, very good, I appreciated the gesture. I also found out that Matt was going to be on season two of Brew Dogs (a TV show on the Esquire network where two Scottish brewers travel around the US and brew over the top beers). Apparently he is going to be extracting gold from old computer parts so that the Brew Dogs can make the most expensive beer ever. I’m looking forward to seeing that episode. After the reception my host, Brent, took me to Angel City Brewing in downtown LA, a bonus that I did not anticipate. 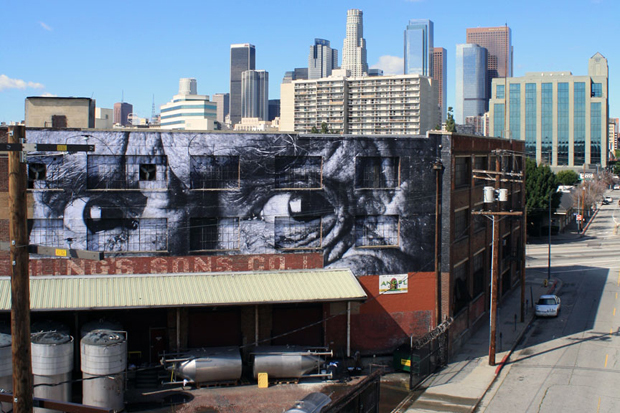 It’s set in an old industrial warehouse, but unlike the suburban surroundings of the San Diego warehouse breweries, Angel City is located in a very urban neighborhood near the little Tokyo district of LA. The inside is a massive space, and the walls, floor, etc. are not much different than what you would expect for a hundred year old warehouse. Where they have decorated they’ve gone in for art deco design elements, and the overall effect is pretty cool. The picture below (which I took off the web from www.theoriginators.com) shows a good view of the brewery from the outside. I love the wrinkled eyes painting on the building, but I have to admit I did not notice it when I visited. 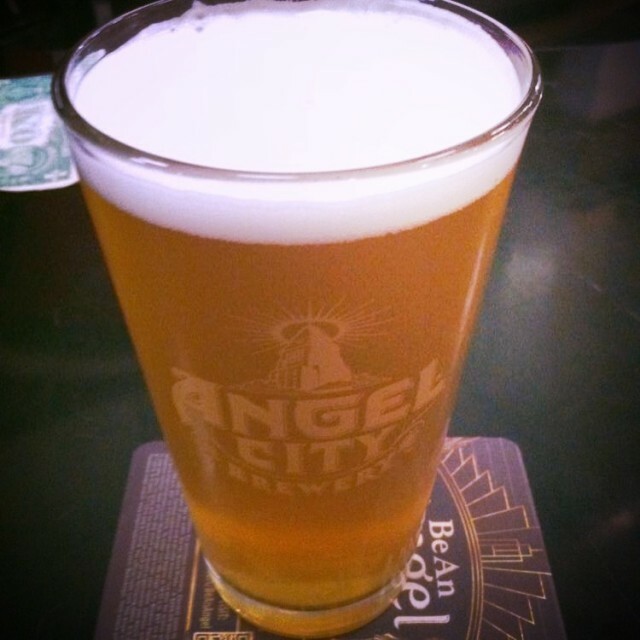 I’ve read several reviews of Angel City beers from fellow beer blogger, LABeerScene (are you still out there?) so I was looking forward to trying their beer. They had a half dozen or so beers on tap. The one I tried first, White Nite, was one of the most intriguing beers I had on the trip. It’s billed as a golden stout and it was served on nitro. True to form the beer is a clear golden yellow color with a big creamy white head. Although looks like a Kölsch (see photo below), the smell and taste are much closer to expresso, with some complimentary fruitiness, and a very creamy mouthfeel. There isn’t any bitterness from the charred malts that you often get with coffee-forward stouts. I’m guessing they use some kind of coffee extract. Whatever the recipe I really enjoyed it. I also tried the Eureka Wit and the Schwarzbier, both of which were solid takes on their respective styles. I would avoid their Berliner Weiss though, it was milky white and not particularly tart. I don’t know what was going on with that beer but not only was not at all to style it was barely drinkable. We finished the night by eating at a Belgian themed restaurant/pub called Little Bear in the LA Arts District. Once I saw they had Logsdon Siezoen Bretta on tap I didn’t need to look any further at the beer menu. This was the second time I have seen this beer outside of Oregon, the first being at the Pizza Port bottle shop which was my first stop of the trip. The symmetry of beginning and closing the trip with my favorite beer was an unexpected icing on the entire trip. This the final stop on one of the best beer trips I’ve ever had. If you have a chance to take a short (or long) beercation I can’t recommend Southern California enough, particularly San Diego. If you haven’t read about my adventures on the first three days of the trip check out the links below.